The resort's pool is surrounded by a gorgeous garden of palms and flowers. Makena Surf is the only resort on the beach. All condo residences feature amazing views of the great blue ocean. You've got almost private access to an intimate stretch of sand. The greens of Wailea Golf Club blanket the hillside above you. Share a moment on your lanai as the sunsets over the ocean. South of Wailea, you're away from all the crowds and traffic. It’s like a private family retreat, tucked away from all the action along the gorgeous unspoiled coast just south of Wailea, but close enough to enjoy everything that the area has to offer. Makena Surf, A Destination Residence backs right onto the beach, and it’s the only resort on this stretch of sand, making it seem almost private. The resort has a gated entrance, giving you peace of mind for a safe family vacation. The grounds are lush with dense palms, tropical flowers, and herbs. Gardens flow out onto the pool area, which feels as if it’s hidden in a forest. There are two pools to choose from or try them both. Comfortable lounge chairs are perfect for working on your sun-kissed look or catching up on your latest read. When the kids get hungry, have a family cookout on the bbq grills. There are four tennis courts; two of them lit, so you can get in a match even if it’s dark outside. There are also a number of friendly cats that like to hang around the resort. One- to three-bedroom condos are air-conditioned and sleep two to six guests. Full kitchens are stocked with what you need to whip up anything from sandwiches to Thanksgiving dinner. Safeway, Foodland, and Times Supermarket are all fifteen minutes from the resort, so you have no shortage of options when it comes to groceries. There’s no need to worry about missing the latest episode of your favorite show thanks to the cable TV. Surprise the kids with family movie night, thanks to the DVD player. Pop some popcorn, call everyone into the living room, and let the kids choose from the movies you packed from home. At the end of your vacation, take advantage of the in-suite washer/dryer and do a few loads. Now all you have to do when you get home is unpack. Upgrade to a deluxe two-bedroom condo for a recently renovated unit, or to a prime two- or three-bedroom condo for better views from your private lanai. Just south of you are some of the best snorkel spots on the island, including the famous Turtle Town, named for the thousands of green sea turtles that come here to graze on kelp. 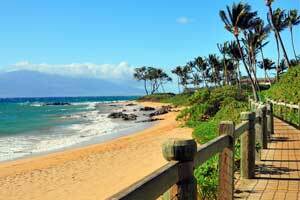 You’ll find a number of great secluded beaches including Big Beach, Makena Landing State Park, and Poolenalena Beach. Visit The Shops at Wailea for a variety of shopping and dining options, ranging from luxury to more affordable options. Window-shop at Gucci and Prada, or go all-out and treat yourself to a new piece of jewelry at Tiffany & Co., or a handbag from Louis Vuitton. Check out the apparel available at Tommy Bahama, Banana Republic, GAP, or Quicksilver. Grab a coffee at the Coffee Bean & Tea Leaf. Ask the barista about coffee-free options for the little ones. Hungry? There’s Ruth’s Chris Steakhouse, Cheeseburger Grille & Tap Room, or Longhi’s. - The front desk is open daily from 8:00 AM - 9:00 PM. The check-in location differs from the property location. To check in, go to 34 Wailea Gateway Place. If you arrive at the property after hours, you'll need to check in at an alternate location: 3800 Wailea Alanui Drive. If you are planning to arrive after 9:00 PM please contact the property in advance using the information on the booking confirmation. Guests driving to the property should contact this property in advance to receive directions to the check-in location. On the day of check-in, follow these directions to the after-hours check-in location: from the Wailea Gateway Center, take Wailea Ike Drive to the stop light at the Shops at Wailea, turn left and take the second right to the security gate at Wailea Beach Villas. Here, you will receive room keys and directions to your resort. Please contact the office using the information on the reservation confirmation received after booking.